Recently one reader asked me to rank the games published in 2009 that I have played. This was an interesting idea. 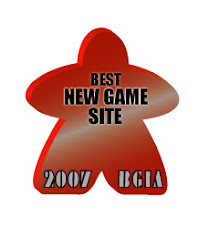 I did a filter of 2009 games at www.boardgamegeek.com (those rated by at least 50 users), checked those that I have played, and tried to rank them. I found it a very challenging exercise. It was like trying to choose your favourite child. To be fair to the games, I am ranking them according to my own eagerness to play them again, rather than the arbitrary "how good is the game" criteria, or "how they should be ranked" (see all those "underrated" or "overrated" comments on BGG). So. Here they are. All ranked, and also grouped into three categories. Note that expansions are excluded from the list. Automobile - Tight and thematic. There seems to be not many things you can do, but every decision is important in this game. Hansa Teutonica - Very interactive. Simple actions, but a wide-range of strategies. The many scoring options can be overwhelming. Endeavor - Quick, and you have the feeling you are just a few actions short of executing your perfect strategy. Some say a bit too polished and too streamlined, but I don't think it was overdone. I like it so much that I'm actually proud I could resist buying it. At the Gates of Loyang - Not bad as a 2P game. I've only played with two (against my wife), but I can imagine how it can drag with more. Axis & Allies Pacific 1940 - Have only played half a game. Japan seems overpowered at the moment, even without attacking in Round 1. There is a variant where Japan is not allowed to attack (except China) in Round 1, to balance the game. Need to play again. Shipyard - A pleasant surprise. I had expected something overly complicated, and the rondel mechanism itself isn't something I drool over. It turned out to be a nice build-things-and-feel-proud game, and the rondel mechanism just fades into the background. It's a seamless part of the game, but it is not the game. Cyclades - Clean, streamlined, multi-player conflict game. Feels like The Settlers of Catan in complexity. Campaign Manager 2008 - Thematic card game for 2 players. Normal game (i.e. with card drafting) is much better than the beginner's game. Bonnie & Clyde - 5th in the Mystery Rummy series, which I've always enjoyed. I don't think any rummy game can ever replace Mystery Rummy: Jack the Ripper as my favourite rummy game, but Bonnie & Clyde is quite decent, and unique too. Power Struggle - The corporate politics theme did not annoy as I feared. In fact it helps to tie the many moving parts together. Dungeon Lords - Given such a complex game, the double-guessing part turned me off a little. Roll Through the Ages - I really should play this more. I'll probably like it more if I play it more. There are many different techs and combinations of techs that I haven't explored. And this is a short game. Waterloo - The combat resolution is a little convoluted and takes time to digest. I will have to relearn it when I play again because I've forgotten it all by now. Vasco Da Gama - I think I missed the big picture in my first play, and was too tactical. Pang won decisively by one big move which he had planned for for some time, and none of us saw it coming (or at least didn't really try to stop him). Summoner Wars - Well-balanced battle game. Carson City - Construct buildings, earn money, fight when necessary / profitable, then plan to convert what you build into victory points. Didn't feel very new or different, despite the gunfight mechanism. Macao - it felt JASE (Just Another Soulless Euro) to me (sorry), despite the never-seen-before windrose mechanism. There are multiple paths to victory, but they feel like mechanisms looking for a theme, and the mechanisms aren't very interesting to me. 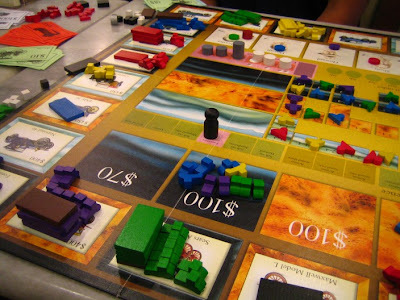 Homesteaders - 10 rounds of auctions, but there is a lot of thought you need to put into every auction decision - which tile to bid for, how much to bid for, when to pass etc. It's a lot about getting good combinations of buildings. 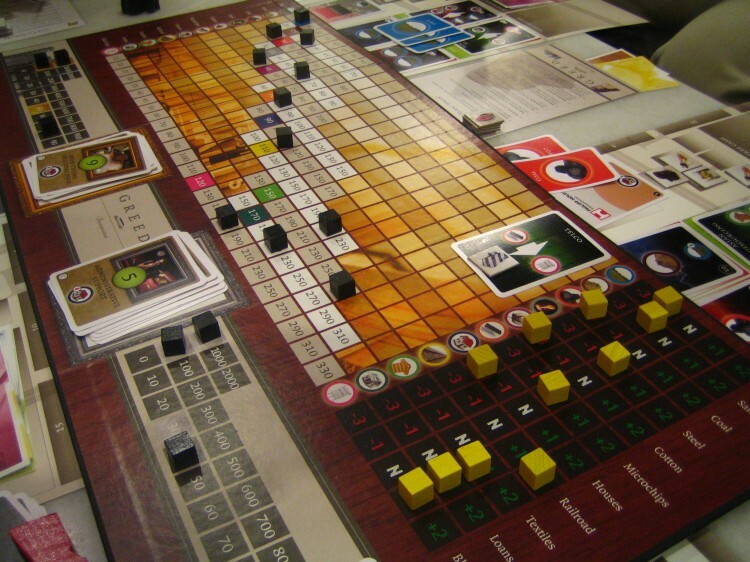 BoardGameGeek Game - It's mostly about collecting sets. Although it's fun to see so many boardgames and elements of boardgames in one single game, the gameplay didn't really grab me. Middle Earth Quest - The game is fine, and I did enjoy my play. It's only the genre that deters me. I'm not very into the fantasy theme or Role Playing Games-like boardgames. Ra the dice game - Nothing wrong. Just unnecessary. Because Ra is better. Rabbit Hunt - It was a pleasant surprise when I first played it. It certainly is quite unique. You need to keep a poker face as you hide your rabbits, and you need to try to read your opponents. I'm not sure why my enthusiasm dropped very quickly. Maybe I just don't like games with bluffing, although mechanism-wise I think the game concept is interesting. Have not played enough to decide: Factory Manager. I certainly enjoyed installing lots of interesting equipment in my factory. The artwork style (by Lars-Arne "Maura" Kalusky) contributed a lot to my liking of the game (I guess I am superficial at times). The game mechanism is a little quirky. The game is quite fast. I just need to play more to decide whether it has good replayability. Dominion: Intrigue - Well, I tend to think of this as an expansion, although it contains components for a complete game. Dominion would be in the Happy To Play category for me. Steam - I'm happy enough with Age of Steam (Keen To Play), so trying Steam is low priority. Chaos in the Old World - Han has this, but we still have not had the right occasion (4 players exactly) for this. He has played a few times. Small World - I've played Vinci, and it'd be a Happy To Play. No real urge to try Small World. Imperial 2030 - Have not tried the original Imperial either. Claustrophobia - likely not my cup of tea. Space Hulk (3rd edition) - I've played 1st edition with Han a few times. This would be a low Keen To Play or high Happy To Play game. Thunderstone - I'm contented with Dominion being the only deck-building game I play. Tales of the Arabian Nights - I think of this as a much older release. I have played it. It's very different, and eagerness to play will depend very much on who I'm playing with. At the moment, I'm probably Lukewarm, but I hope when my children are older we can play this together. Railways of the World - I have played Railroad Tycoon. I think it's quite similar to Age of Steam. I'm happy enough with Age of Steam. I actually prefer the more spartan artwork of Age of Steam. Tobago - interested to try at least once. Mr. Jack in New York - Played the original Mr Jack and thought it was just okay. 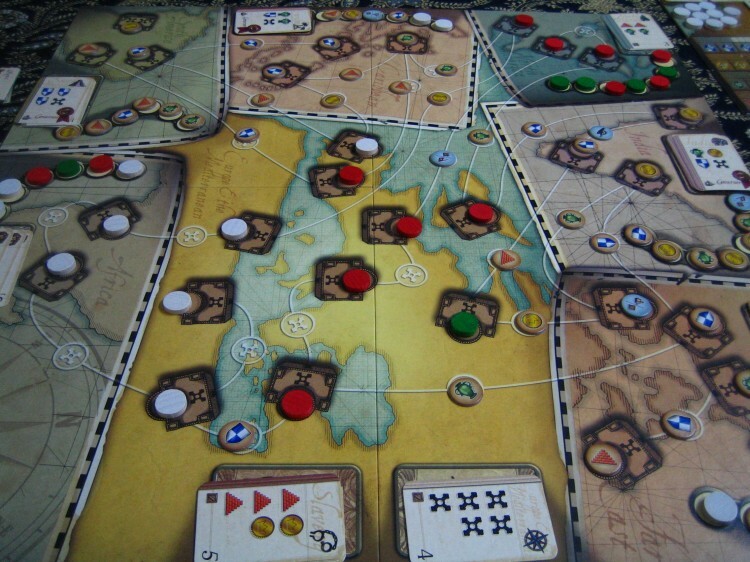 Stronghold - I have heard this is quite a tense game. Would like to try but I don't know anyone who owns this. Jaipur - Probably would be a good spouse game. But then I'd rather play something meatier. At the moment my wife is willing to play Race for the Galaxy and Innovation. We don't even play Lost Cities much, so no point for me to get a quick filler type game. Last Train to Wensleydale - Martin Wallace game. This tempts me a little now that First Train to Nuremberg is out and it contains this game too. Richard III: The Wars of the Roses - No big urge to try this since I have Hammer of the Scots. I hear it's cleaner, more streamlined. I don't mind some of the rough edges in Hammer of the Scots, and enjoy the very asymmetrical sides. Maori - interested to try. Axis & Allies Spring 1942 - I wonder how much quicker this is compared to Axis & Allies Anniversary Edition (AA50). If it is significantly shorter, I may actually prefer to play it over AA50. It uses the new concepts introduced in AA50, which had improved the game. And while we are doing that, no harm explaining to him how Imperialism works, whether for the Europe map or the megalomania 2030. That said, I'm interested to try 18XX. Just go gentle on the newbie ok! Don't get me wrong, I love my first play of Greed, it's just that I realise too late that it's quite powerful to practice nepotism (have your own guys in the Prez and Vice Prez slots). And it's good to start new companies with cheap assets. We've not played this for long so i'm sure i'll re-bungle in my strategies the next time we play it. I think Imperial is a better introduction to the 18XX series (after Chicago Express). After that you'll be juggling/synergising companies like an expert. So what do you think of 2009 as a year for new games? To me it seems that it was a very productive year with titles like Hansa Teutonica, Endeavor, Automobile, Carson City, Cyclades, Macao, Vasco da Gama, Dungeon Lords, Steam, Small World, Egizia..the list goes on. Maybe there wasn't a Puerto Rico among them, but to me it seems like 2009 but a whole lot of interesting games out there for people to buy depending on their tastes. ^ but = put in that comment. I don't really compare the years to see which ones are better or worse in terms of the games released. One reason is I don't always get to play the latest games all the time. Sometimes I only get to play a good game a few years (or more) after it is released. For me personally, 2008 was the only year that stood out for me, because that was the year I first found games that I rated 10's - Race for the Galaxy (an 2007 game), Through the Ages (original release 2006, my FRED edition 2007), Agricola (2007). I guess you can say I'm roughly one year behind the frontline. Indeed trying to rank the 2009 games was quite challenging. I had to stick to a simple criteria (my own eagerness to play) to make it manageable. But it was an interesting exercise, including the part when I discovered how many well-received 2009 releases I have not played. So maybe I'll make this an annual exercise, i.e. I'll rank the 2010 games at the end of 2011.